A jail formed by the merger of three West Midlands prisons will not be called HMP Redditch, the town's MP, Home Secretary Jacqui Smith, has said. Ms Smith's suggestions are North Worcestershire Prison, HMP Hewell and HMP Blakenhurst but said she would be happy to look at other names. Blakenhurst, Brockhill and Hewell Grange prisons are coming together to form a "super" prison. 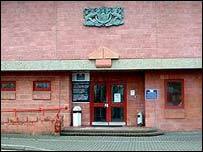 Some residents objected to Redditch's name being linked to a prison. Ms Smith said after her representations she was delighted to learn from Justice Minister David Hanson that he had withdrawn the name. She added there is a new four-week consultation to decide on a new name. The three prisons, all near Redditch, will not move site but instead will be run by one governor, one senior management team and one staff group.